Share a toast with this one-of-a-kind handcrafted stemware set by JBC Woodcraft®. This handsome mixed-media design is handcrafted from Lignum Vitae and Ipe. These unique 12 oz. 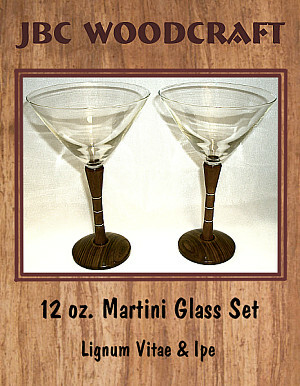 martini glasses measure approximately 4-7/8" in diameter by 7-3/4" tall.